The life-sized Gundam RX-78 in Odaiba is quite spectacular. I really cant convey how "real" it looks, and how many memories of watching TV as a kid back in the early 80s during my "italian summers" it brought back. Still wonder if tech for a "Mobile Suit" like Gundam will ever exist or if it makes sense. The Japanese version of anthropomorphic combat vehicles is much in line with Gundam (even if I do prefer Zaku's) and Macross, while western sensibilities seem to favor Mechs, which pretty much are tanks with legs. The aesthetics of Japanese robots is also inspired by samurai armors, and sometimes even western medieval armors. Also, they use weapons...like giant versions of cannons, machine guns and swords. Western mechs have weapons integrated in their system. So...to really go into geek talk; what makes more sense? Pro-Gundam: An argument can be made to "menacing" robots being more effective in battle... so maybe the Samurai/Demon-face armor inspiration has a purpose. Pro-Gundam: hands are useful to have (and make the interchangeable weapons .easier to believe). Pro-Mech: is their really need for a head and "eyes"? Wouldnt it make more sense that sensors for the pilot be all over the body. Pro-Gundam: if a neural-piloting system were devised (plug in Matrix style), then it might make sense that a human pilot would need to relate to certain anthropomorphic shapes of the vessel it is piloting, hence hands, legs, head and whatnot could make sense. Pro-Mech: more realistic in a "tank-like" piloting system. Pro-Mech: integrated weapons are also more consistent with current tech, with loadouts being somewhat modular. 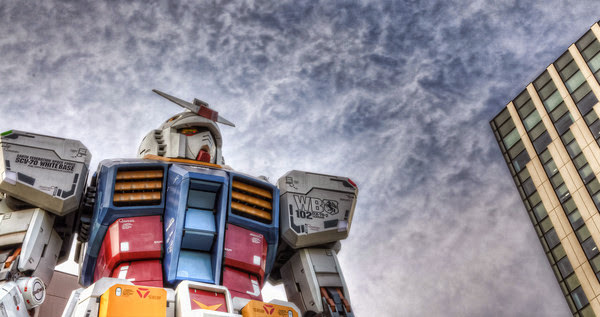 Pro-Gundam: japanese robots look cooler. And the mechs that look cool, are sort of going in Gundam's direction. What else would you add? And do you agree? To check out how the giant Gundam was made, see Danny Choo's post, here. Wow wow wow love the pictures.